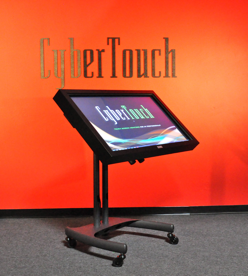 The What: CyberTouch has introduced the Mono Mobile, a mobile touch table designed ergonomically to invite users to approach, interact, and collaborate with the content. The What Else: Mono Mobile (P/N MML Series) has a base complete with wheels allowing the table to be moved into different locations. Mono Mobile also has an adjustable height so users of different statures may comfortably interact with the content. Advanced-Infrared touch detection offers ultra-fast touch response with no ghost or shadowing and 32 simultaneous touch points. Unaffected by ambient lights, Mono Mobile is designed for high-bright environments such as lobbies and large venues. The Mono Mobile line of multitouch interactive touch tables is designed for indoor applications. All Mono Mobile Tables are fully integrated plug-and-play. Offered in single-monitor configuration, Mono Mobile ranges from 32” to 65” in diagonal sizes. Mono Mobile incorporates its own internal PC with a choice of Win, MAC or Linux operating system.